The moon is on the rise and with it the pressure of tide in all things, everything rises and falls with the coming and going of the moon. Old time lunatic asylums were so named for the propensity of the inmates to agitate with the waxing of the moon. The moon acted on their mentality, pulled it out, magnified it. The moon magnifies or activates what is already there, in the mind. What you acknowledge is what is there, more and more. Be careful what you acknowledge, or you might end up a lunatic, tic, tic. When the madness is gone there’s only the pressure. Look up, see the milky light of the full disc on the cold dark blue sky. The quiet emptiness, emptied of human mind. What a beauty that is. 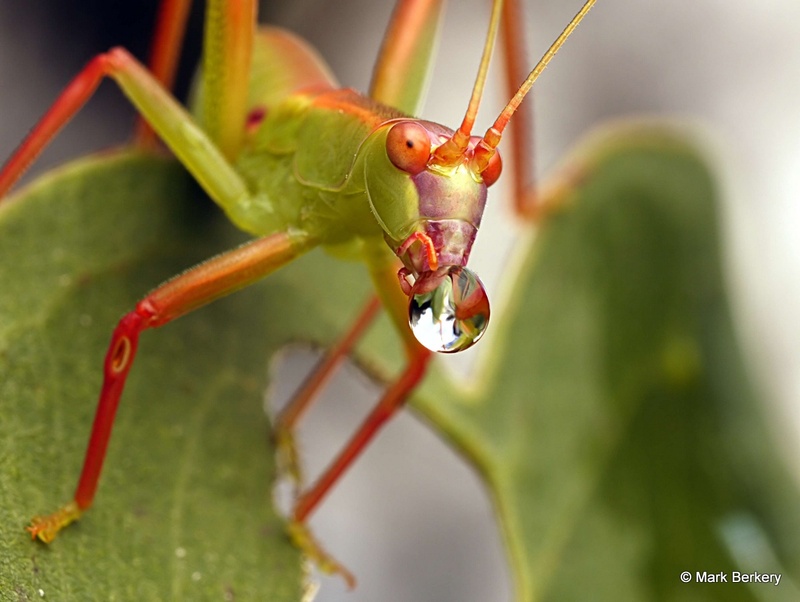 Hi Mark, I didn’t realise a grasshopper could look so gorgeous. Hi Margaret. Yes, there is beauty in all creat-ur-ed things. Love the slightly barmy expression. I think it was getting curious too, after an initial fright. Almost every time I walk out the door I am kamikazed by a grasshopper. Usually in the face. I love that this one is blowing a spit bubble and that it has cute little ovals on the front legs. Excellent photos and a great capture of something I’ve never seen before. Thanks David. One moment it wasn’t, the next it was. Maybe, as in a link below, there is some defensive quality to it. 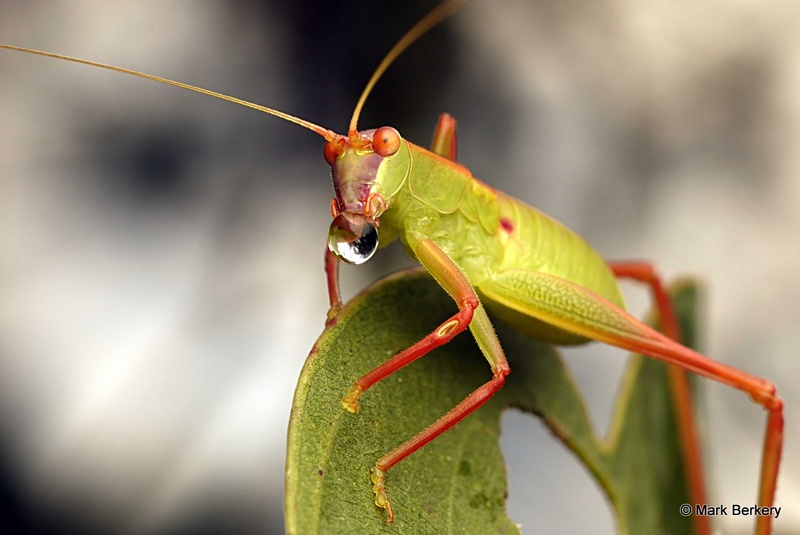 The hopper was on a eucalyptus tree and was well aware of me and wary at times. Lovely photos and reflection, Mark; I will be thinking today about the moon — about distillation, magnification, amplification. Pressure. Is your subject drinking, or is there something less apparent going on? Thanks Cate. We overlook the significance of the moon – or a flower, a bird – in our modern world, forever progressing from one thing to another in the mind with no time for simply seeing or seeing the simple. 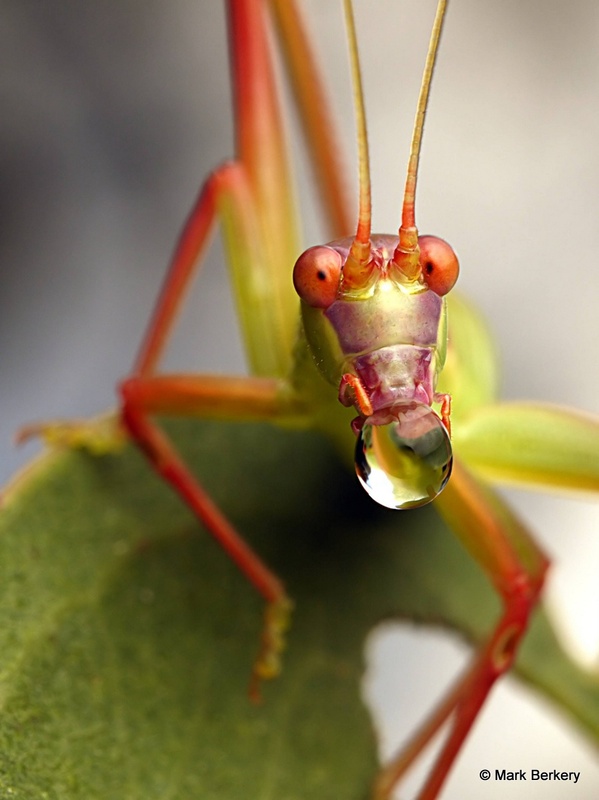 The grasshopper is regurgitating liquid, many insects do it. Maybe it helps with digestion, to oxidate or evaporate the mix – just guessing. See – https://en.wikipedia.org/wiki/Regurgitation_(digestion) or for defense – https://books.google.com.au/books?id=PYRFDrZs9QAC&pg=PA632&lpg=PA632&dq=insect+regurgitating+liquid#v=onepage&q=insect%20regurgitating%20liquid&f=false Our own intriguing and sometimes obvious nature.